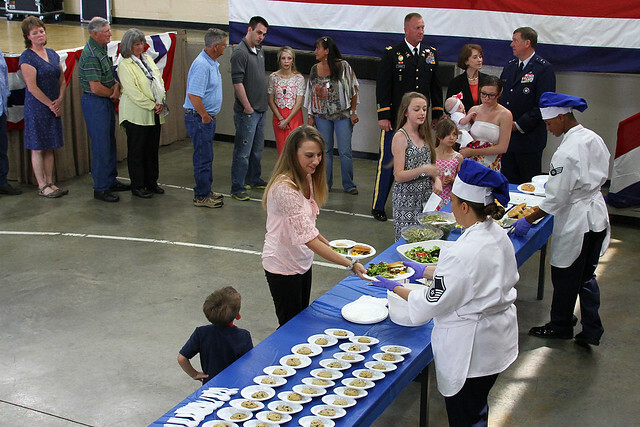 FRANKFORT, Ky. – Guests at the unveiling of the Kentucky National Guard Memorial on Memorial Day were treated to a luncheon of Kentucky Proud products prior to the ceremony at the Boone National Guard Center. 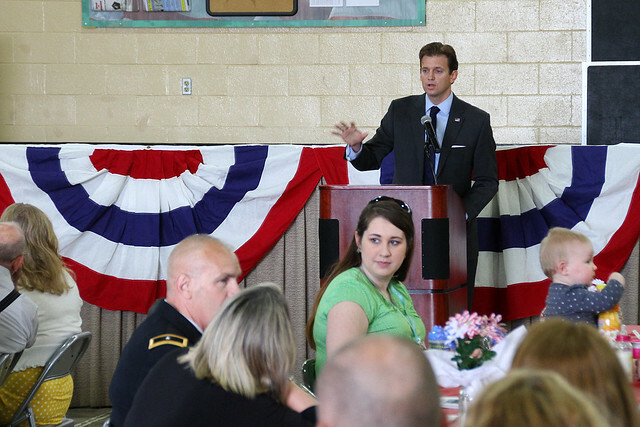 The luncheon honored survivors of Kentucky National Guard soldiers and airmen who fell in the line of duty. Participating Kentucky Proud and Homegrown By Heroes vendors included Brooks Meats of Boone County, Bush Farms of Boyle County, Chelsea Farms of Shelby County, Crank and Boom Ice Cream of Fayette County, Elmwood Farms of Scott County, Evermore Farm of Fayette County, Kight’s Pecans of McCracken County, and Weisenberger Mill of Woodford County. The meal was prepared by celebrity chef, lifestyle coach, and author Kate Horning of Lexington with members of the 123rd Airlift Wing of the Kentucky Air National Guard. The Kentucky National Guard Memorial was built to remember the hundreds of soldiers and airmen who perished since 1912, when Kentucky adopted federal legislation that established the modern National Guard. The memorial features a larger-than-life bronze sculpture of Daniel Boone sculpted by Wyatt L. Gragg of Prospect and a 22-foot-wide granite stone in the shape of Kentucky bearing the names of Kentucky National Guard service men and women who have died in the line of duty. Smock Fansler Corp. of Indianapolis is the general contractor. Other contractors include Bender Associates Architects of Lexington and Muldoon Memorials of Louisville. The shrine was built with private funds.